When a hot water heater breaks, you need it repaired fast. That is why Master Plumbers of North Carolina provides professional emergency installation, service and repair in Greensboro, Winston-Salem, and High Point NC. 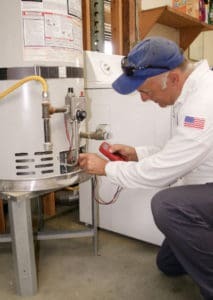 The highly trained plumbers at Master Plumbers of North Carolina are experts in not only repairing damaged hot water heaters, but also in extending the life of your appliance through regular service and maintenance. See our Plumbing Service Maintenance Agreement for details on how you can keep your system up and running for years to come. Check / Drain the water in the bottom of the tank. Sediment that collects in the bottom of your hot water heater tank can cause all kinds of issues. Draining it periodically helps to prevent these issues from making regular maintenance a plumbing emergency. Sediment built up in the bottom of your tank can interfere with the heating process and cause your hot water tank to overheat, as well as increase your power bill. Sediment buildup in the tank can also clog the drain valve or circulation lines, potentially burning out the recirculation pump. Check the energy source for potential problems: If you own a natural gas water heater, the pilot light should be blue with a yellow tip. If it is not, we will let you know to contact your natural gas supplier for an adjustment. Soot buildup in the flue can cause harmful carbon monoxide gas to leak into your home. If you own an electric hot water heater, hardened calcium carbonate buildup in the sacrificial anode rod reduces the protection to the inside of the water heater. A trained Master Plumbers of North Carolina plumbing technician can repair the problem quickly and professionally. North Carolina homes and businesses turn to Master Plumbers of North Carolina for their Greensboro and Winston-Salem hot water heater repair. Whether it’s an emergency that needs attention any day of the week or any time of the day, our professional plumbers have the training and ability to make the repairs you need, or work with you on a maintenance agreement to extend the life of your hot water heater. Proper installation or repair is not as simple as hooking up a few hoses. Without the correct fittings and knowledge, your water heater can end up costing you much more than its purchase price. The trained plumbing professionals at Master Plumbers of North Carolina have performed numerous fixture and water heater installations across the Triad area. Whether for home or business, the professionals at Master Plumbers help you to choose a water heater that is best for your application. Proper hookup is important to ensure performance, but often overlooked proper insulation will save you energy and money in the long run. Water heater installation is just one plumbing service that Master Plumbers of North Carolina offers to our customers. 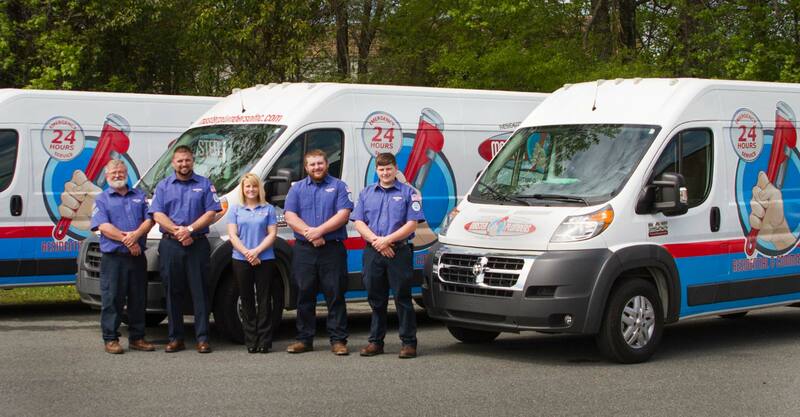 Call our professional plumbers any time of day at 336.676.5544 to properly install any water-based appliance efficiently and correctly, whether its garbage disposals, water filter systems, dishwashers, washing machines, or refrigerators. To see what else we can install in your home or commercial location, click here.